When I received the invitation to participate in today’s parliament, I spent 30 minutes of my life investigating whether it was some very niche variety of spam. Maybe it wasn’t phishing to drain my bank account of my non-existent savings, but it was definitely suspicious. It felt like an actual impossibility that I was supposed to be here. This is a line-up filled with brilliant editors, and fabulous event organisers, and writers who have created works of beauty and intellect and a...third thing. Me? The last piece of writing I had completed was a eulogy I performed at a comedy night called Dirt that ended with me cramming seven hot dogs in my mouth while writhing around to a dance remix of Danny Boy. As I was beating myself up for not being literary enough, I realised what was up with that email. That email was a trap. Opening that email had unleashed what can only be described as a time vortex, that had thrown me all the way back to 2008. You see, 10 years ago, I was in the first year of a Masters degree in Editing, Publishing and Creative Writing and I was convinced that literature was a big, important thing. It was books. Big books. Books that were heavy - in every sense of the word. It was a point of view that was partly self-inflicted. There were plenty of examples to show me otherwise all the way through my undergrad years, but I held onto my belief like I had glued it to my hands in a crafternoon gone wrong. And so I stumbled along, trying to write things that looked like literature, and everything I wrote felt stiff and uncomfortable. My stories were square pegs that I was trying to fit into a roundish hole that looked a lot like Don DeLillo if you squinted at it. It felt awful and it felt dishonest, and so for a while, I stopped writing. I moved on. But the thing about living in a City of Literature is that you can’t escape writing. Slowly but surely, you realise that no matter what community you steep yourself in, you are surrounded by literature. You can fall in love with a turn of phrase in a comedy festival show. You can be awestruck by a panel in a comic. You can be brought to tears by a line in a game on your phone. And behind every form waiting to inspire you, lurks a dedicated group of people ready to welcome in anyone that wants to give it a go. And so that’s what I did. I gave stuff a go. I made comics, I tried to learn how to code. I made work that was flippant and full of nonsense and felt more honest and serious and worthwhile than anything I’d written before. Some of the best writers I know today are improvisers, stand-ups, sketch comedians. They make comics and videogames. They record podcasts. Every day, I’m excited and inspired by the things they make. They might not have written some big important work that will live on in the canon, but with each little creation, they build a big important community that allows more literature to grow. 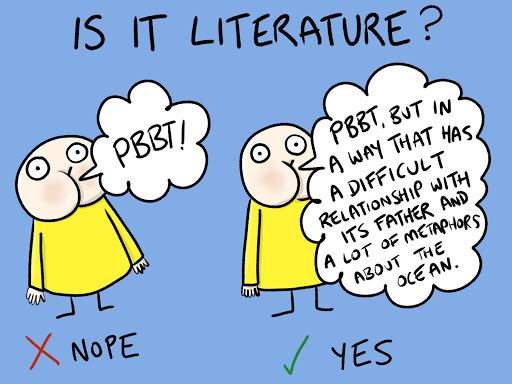 When I think about the literary future of Melbourne, this is what I see. An ever-expanding opportunity to explore new forms, new genres, new voices, but also old forms, old genres, old voices that have been ignored, designated as lesser and lower. I see a city where the word ‘literature’ is irrevocably entwined with not just books, but storytelling in all its disguises. I see a city where a well-timed fart noise is valid as a fat new Franzen. Over the last 10 years, this city of literature has unfurled before me like a bain marie at Smorgy’s - teeming with life and always filled with something different and interesting and potentially dangerous. And I, in turn, have embraced that bain marie, grabbing as many hot dogs as I can fit in my fists, and making them a part of me as well as I can. It’s a lesson that has taken me a decade to learn and re-learn and re-learn again, a lesson that I hope to teach others - when I put seven hot dogs in my mouth, I am doing literature, and I hope that in the next ten years, Melbourne hands me more, so I can gladly cram them in my ever-expanding gob. Thank you. This piece was written for Our City of Literature Parliament: Future Melbourne at the Wheeler Centre to celebrate 10 years of Melbourne being a designated UNESCO City of Literature.